Arsene Wenger has often been called a stubborn manager by his own supporters. His method have brought huge success to the London club, but some seem to believe the tactical progress has stagnated. One such area is out wide in attacking zones; Adithya Suri gives us some insight into this. Arsene Wenger’s disdain for traditional wingers was evident from the very beginning of his tenure. Marc Overmars, Robert Pires, Freddy Ljungberg all used to start on the flanks only to find themselves in goal scoring positions near or inside the box. Wenger preferred his right sided wingers to be goal mouth players and his left wingers to be skillful attacking midfielders. If one looks through Arsenal squads from 1996 you’ll find that the teams rarely employed wingers whose job was to inject crosses, nor did they employ targetmen who were to get on the end of said crosses. Wenger has a belief in his high tempo possession play that creative midfielders find themselves on the wing to help greater link up with the forward line. This facet of wing play had become a mainstay for many years at the club and players, who came in, were brought according to the same principle. The death of the 4-4-2 that Arsene used in the glory years was brought about by teams creating imaginative shapes in the center of the park by introducing a third man. A two man midfield, regardless how great the two men were was never going to compete. Not only Arsenal but there was a change in mentality in world football with the possession based midfield play becoming the new standard. Arsenal switched to the three man triangle built around the creative talents of Cesc Fabregas. The passing game only got more prominent with the change in playing style. Yet Arsene Wenger stuck to his guns against traditional wingers even in the new system. With the slow dismantling of the Invincibles team and the trophy drought that ensued, fans and pundits were beginning to discover a certain pattern in Arsenal’s wing play. Central attacking midfielders were shunted to the wing by Wenger in a move that still continues to draw the ire of many a fan. The problem with such a set up is this. Wingers are drilled from a very young age to help their defenders by tracking back. Attacking midfielders were not expected to shoulder great defensive duty. Yet that is what Wenger expected from his midfielders when he put them on the wing. Fans berated that Wenger didn’t know what he was doing; pundits decried Wenger shackling the attacking talents of some of his players. Number 10s who never learnt to track back cannot be expected to keep the shape on the wing. It takes a different level of tactical understanding to execute that role to perfection. Even in today’s world of defending from the front very few number 10s share defensive burden. Arsenal’s oft criticized defense in truth never received help from its ‘wingers’ nor did they have a shield in their midfield to provide cover. The hard hitting talents of Viera and Gilberto were sacrificed over the years for more fluid variants in Ramsey and Wilshere. The departure of Flamini, Arsenal’s last purveyor of the dark arts at the base of the midfield coincided with the Gunners becoming notoriously porous at the back. When the left midfielder cut inside and the left back bombed forward there was no one willing to fill in the space behind. Hence the conceded goals, hence the cries of outrage. When Andrei Arshavin was brought in, Wenger envisioned a player who could pass, and would cut into the box from the wing to take shots. Although Arshavin never truly settled into this foreign role it drove home the fact that Arsenal were to play this tactic to death. Samir Nasri was a breath of fresh air for Wenger in the season where he exploded to become the player he can be. He was quick, tactically astute and possessed great vision. He had also developed the ability to get into goal scoring positions. Samir Nasri is as close Arsene has found to discovering the true heir to Robert Pires’ role. 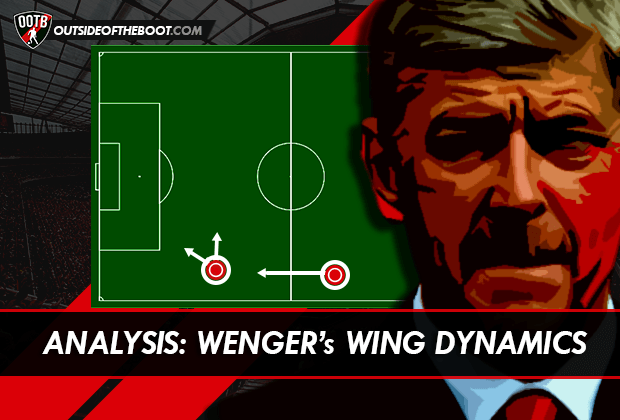 For that is why Wenger distorts his wing systems. The combination of a great attacking fullback and a tactical, composed creative midfielder cutting in is what Wenger has been trying o rediscover since the loss of the Ashley Cole- Pires combination. Arsene spent years and millions looking to recreate such a combination which brought him so much success earlier in his tenure and it remains the reason why Arsenal rarely play pure wingers on the left side. A clear testament of this ideology is how similar Gael Clichy and Kieran Gibbs are to a young Ashley Cole. Both Gibbs and Clichy were groomed through the system as natural heirs to the very attack minded left back role that Cole had provided to the Invincibles attack. But why does Wenger persist with this system? Why is he so inflexible with his tactics and ideologies that he refuses to consider wingers on the left? The answer is revealed when we look at how potent the left sided combination of Pires, Cole and Henry once was. When Arsenal played a 442 that was the overruling dynamic. Robert Pires was a silky central midfielder who started on the left but drifted infield to play balls through defenses. He was blessed with a great vision and touch and majority of his assists were balls played through to Henry. Thierry Henry used his great speed and awareness to run between defenders causing havoc with his ability to score or pick out runners from the other side. Ashley Cole was a fast attack minded Fullback who more often than not found himself in a more advanced position than Pires. He stretched the defense and gave Pires an outlet to pass into. This triumvirate was responsible for 60 percent of Arsenal’s goals in the 03-04 season. Keep in mind this was a team that had the marauding qualities of Viera and the class of Bergkamp to name but a few. Looking back at all the players Arsenal have signed and groomed over the years for the left only Lukas Podolski could be marked as a winger but a case for him being a central striker can be made as well. Gervinho, Chamberlain, Miyaichi, Gnabry, the number of flank players who cut in and shoot bought by the club shows Wenger’s wing philosophy. Another clear example of the mindset is the difference in Chamberlain’s playing style when he is deployed on the left. As a right winger Chamberlain is expected to beat players for pace with skill and trickery and rush to the byline to fire in low crosses. On the left however you would rarely see him going to the line, rather he cuts inside near the edge of the box to shoot or thread passes. 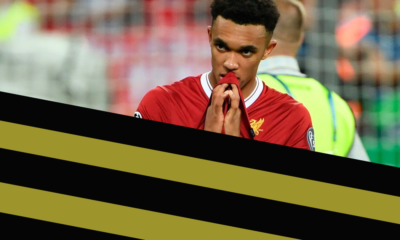 The recent Anderlecht match where he played on both wings reinforces the theory. Santi Cazorla and more recently Mesut Ozil have been victims of the same policy, all for discovering a lost dynamic. With the death of the 4-4-2 and the need to play only one striker up top one can argue that it becomes impossible to recreate this left sided combination and there would be some truth to it. Without a left sided striker there would be no one to work the channels. One man up top could not be expected to hold up the play as well as play off the services of just one side. It would be much too lopsided. But what one fails to realize that a fully fit Arsenal, plays with two strikers. It’s just that one starts on the wing and is called Theo Walcott. His importance to Arsenal’s play is paramount and of utter consequence. A striker is someone who feeds of his team threading balls behind the opposing defence, someone who plays off the shoulder of the last man and scores goals for his team. Walcott in today’s Arsenal line up performs all those roles, the only difference being a positional one, he starts on the flank. While Henry worked the left sided dynamic by running between the left centre back and left back, Walcott works it by running between the right centre back and the right back. With a central attacking midfielder used on the left and drifting to the center to be a pseudo number 10, Arsenal outnumbers every other team in midfield. This creates an overload, a 4 v 2 or 4 v 3, a ratio even more skewed during counter attacks. With the opposition in disarray to deal with the number of skillful passers in midfield, Walcott breaks from between the center back and fullback, and is found by diagonal passes or though balls that are played behind the defense. At least, that is the idea behind the style. He is in some ways Henry’s successor in this system Wenger is hell bent on recreating. The 12-13 season with Cazorla on the left saw this tactic finally bear dividends. With Cazorla’s extremely quick feet and vision Walcott became a potent goal scoring threat. The assist did not always come from the little Spaniard’s boot but him driving into the centre and creating a cluster of Arsenal midfielders created acres of space for Walcott to run into. The numbers tell the story: 21 goals from the right wing. It also lends explanation to why Walcott stayed on at Arsenal, content to lay out wide when the main issue with his contract was that he wanted to be played as a striker. Long term injuries to key players meant Wenger has rarely been able to put forward a settled lineup. There is always a work in progress somewhere in the team. With the arrival of Alexis Sanchez and Danny Welbeck, Wenger has discovered two strikers who are willing to run into the channels and harass defenders constantly. Welbeck especially works the left sided channel brilliantly and the last few weeks have seen Arsenal revert to a 4-4-2 type approach. In some form or another, this dynamic will continue to persist in an Arsene Wenger team. Now it will be interesting to see whether Wenger can stretch it to accommodate a returning Walcott.